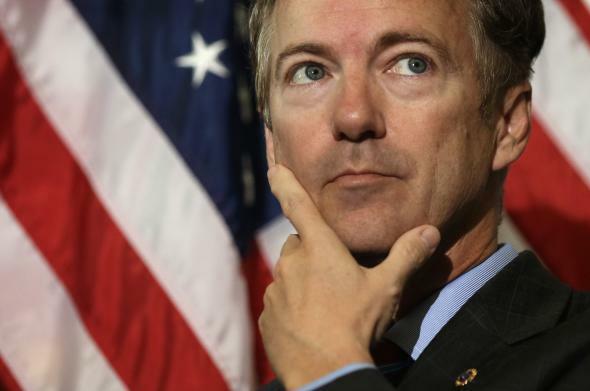 Rand Paul 2016-election law: How Kentucky senator can run for re-election and president at the same time. Rand Paul can still run for both re-election to the Senate and the GOP’s presidential nomination if he’s willing to get creative. Sen. Rand Paul is on track to officially jump into the presidential race on April 7, the New York Times reports, citing “people close to” the Kentucky Republican. “Only his family’s doubts could change his mind at this point, said associates of the senator,” according to the Times. While Paul’s entry into what is promising to be a crowded GOP field appears nearly a done deal, the first-term senator has one looming problem ahead: Kentucky law dictates that “no candidate’s name shall appear on any voting machine or absentee ballot more than once.” In other words, by law, Paul wouldn’t be able to compete in both his home state’s GOP presidential primary and Republican Senate primary, which will be held together on the same day in May 2016. Team Paul, meanwhile, has made it clear that their man isn’t willing to give up a second term in the Senate to battle for the GOP presidential nomination. Paul’s best-case scenario appears to be convincing the Kentucky Republican Party to abandon its current presidential nominating system, which assigns delegates to the national convention via its existing May 2016 primary. If Paul and his allies have their way, the state party would instead award delegates through a new presidential caucus that would be held in March 2016. That would allow Paul to compete in his state’s presidential nominating contest and then again two months later in the Senate primary without his name showing up twice on the same ballot. That’s only a temporary solution, though, because Paul would find himself back in the same double-listing pickle come November 2016 if he were to win the GOP’s presidential nomination. If that were to happen, he’d probably need to drop out of the Senate race to avoid having his name appear twice on the general election ballot, once as the Republican nominee for president and again as the party’s nominee for the Senate. But that, of course, would be a problem Paul would love to have. There are also a number of other possible routes around or through Kentucky’s law, as the National Journal documented at length late last year. Alternative workarounds include challenging the law in federal court, or attempting to knock off Kentucky Secretary of State Alison Lundergan Grimes this coming November so the Democrat isn’t around to enforce a strict reading of the election law when the GOP primaries roll around next year. Both of those options come with their own political risks—particularly the latter given the national network of Democratic donors and allies Grimes built up during her failed 2014 bid to upset now-GOP Majority Leader Mitch McConnell’s re-election bid. Even if Grimes were to fall to a Paul-backed Republican this November, it’s unlikely Paul would escape the fight unscathed. Still, even if all else fails, Paul could simply press on by sitting out his home state’s presidential primary. The Kentucky law prevents a candidate from being listed on the same state ballot twice, but it doesn’t bar a candidate from competing in presidential nominating contests in the rest of the country. By passing on his home state’s nominating contest, Paul would be sacrificing a shot at claiming a large chunk of Kentucky’s 40-odd delegates, but it would be a relatively small price to pay to keep his Senate seat. (Paul is well-positioned to win a second-term in the upper chamber, but that becomes nearly impossible if he doesn’t win the GOP spot on the Senate ballot.) It’s also relatively easy to imagine Paul’s biggest supporters in the Bluegrass State rallying around an also-ran in the Kentucky presidential primary in order to prevent a front-runner from inflicting too much damage to Paul in his home state’s nominating contest. If Paul presses forward—regardless of which route he takes—he wouldn’t be the first candidate to find himself competing for two separate tickets to Washington. Rep. Paul Ryan appeared on the 2012 ballot as the GOP vice presidential candidate while still running for (and winning) re-election in his home district in Wisconsin. Four years earlier, Joe Biden successfully pulled off a similar double, winning a seventh term as a Delaware senator while joining Barack Obama on the Democratic ticket. Biden even took the Senate’s oath of office in early January 2009 before stepping down a few days later to assume the vice presidency.